English (Staffordshire), Teapot, 1760/1780. Earthenware (creamware). Chipstone Foundation, 1963.21. Photo by Gavin Ashworth. Chances are that you own a teapot. What does your teapot look like? It’s probably globular in form and might have some decoration applied to it. The Museum has on view a variety of teapots, including two that I find very curious. Both teapots are found in the Loca Miraculi “Cabinet of Curiosities” installation in the Museum’s lower level. 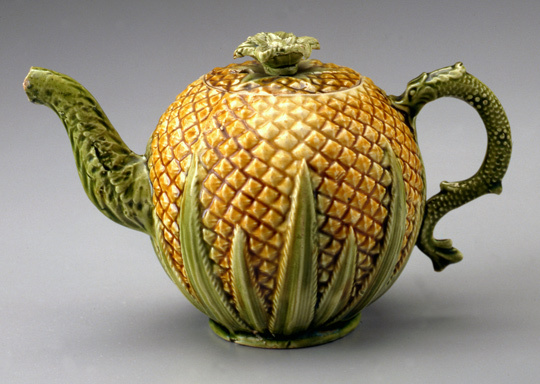 One teapot is in the shape of a pineapple, the other is in the shape of a cauliflower. Both teapots are made from creamware, a white-ish variety of earthenware clay made famous by Josiah Wedgewood in the 18th century. At a time when the whiteness of porcelain was extremely valued by the public, finding a way to make the cheaper earthenware clay white was a big accomplishment. It thus accounts for creamware’s popularity. Although the famous 4 o’clock English teatime tradition dates to the 19th century, tea drinking in England in the 18th century was still performed. In the 18th century, class and social occasions were very structured. An invitation to dinner might warrant serious consideration for both the host and the guest because of the obligations entailed, but tea presented the opportunity to fraternize in a more relaxed environment that might include card playing and dancing. The teapot was a very important part of this occasion as it set the tone for the gathering. A hostess gathering a group to rally around a politician might serve tea out of a teapot with the politician’s image or name. Abolitionists might serve tea out of a teapot referring to the slaves’ humanity. English (Staffordshire), Teapot, ca. 1770. Earthenware (creamware). Chipstone Foundation, 1997.23. Photo by Gavin Ashworth. 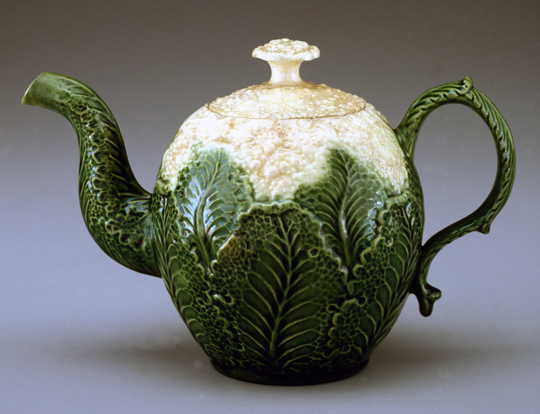 Why have a teapot shaped like a pineapple or a cauliflower? What do this fruit and vegetable symbolize or reference? What would the guests have read into the teapots’ shape? Both the pineapple and cauliflower capitalize on the public’s interest in plants, while referencing England’s rise as a center of trade and commerce. The pineapple was an exotic fruit that did not grow in Europe. Foreign trade in the 16th century brought new imports such as coconuts, pomegranates and pineapples to England. The pineapple was a popular fruit, but it was hard to keep it from spoiling on its long trek from the Caribbean to Europe and thus commanded a high price. Hostesses would use the pineapple as decoration when giving dinner parties as a sign that no expense was too great for the invited guests. It wasn’t long before the pineapple became synonymous with hospitality. The fruit was so popular that in 1675 King Charles II commissioned a painting to commemorate the first pineapple grown in England. 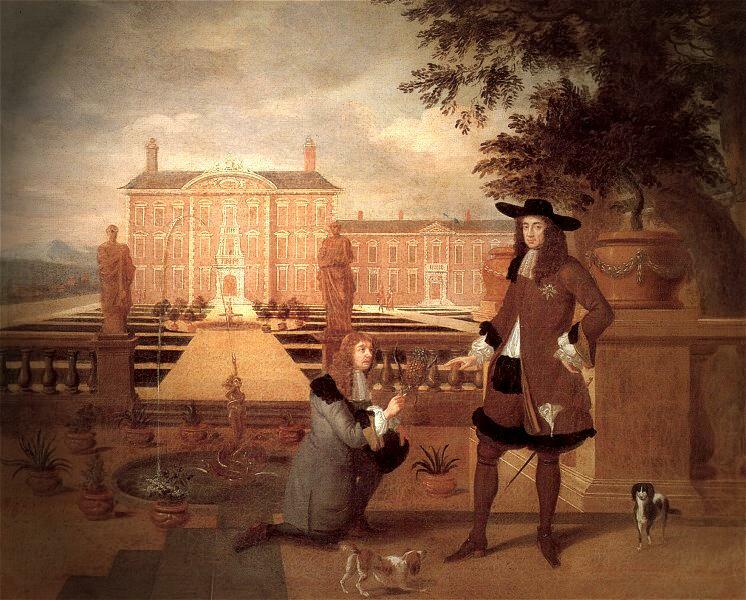 Hendrick Danckerts (Dutch, c.1625 - 1680), The King's Gardener John Rose presenting Charles II with a Pineapple, 1675. Oil on canvas. Collection Ham House, Surrey, UK. The cauliflower, a member of the cabbage family, also had royal connections. It is thought that this vegetable originated in Cyprus. Similar to the pineapple, it came to Western Europe through foreign trade and was made popular by Louis XIV in France. The cauliflower commonly appeared in grand tables after this point. It held an honorable place in gardens because of the delicacy and time required to cultivate it. So, both the cauliflower and the pineapple teapots hint at hospitality and power. What does your teapot say about you? This entry was posted in Art, Curatorial and tagged 18th Century Art, Ceramics, Chipstone Foundation, english art, From the Collection. Bookmark the permalink.